The History of the Royal-Society of London, for the Improving of Natural Knowledge. London: Printed by T. R. for J. Martyn; and J. Allestry, 1667. 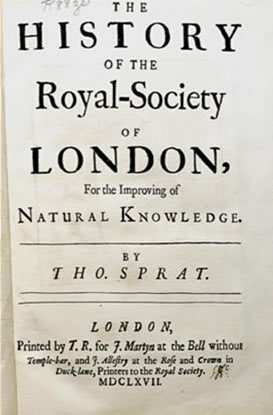 Published only a few years after the 1660 founding of the Royal Society, Sprat's work was the first in a long line of narratives detailing the history of the momentous occasion. It contains one of the earliest appearances of the Society's coat of arms.